Directions to the site: Take Highway 95 South out of Moscow. Turn left (east) on Palouse River Drive. Take a right (south) on Paradise Ridge Road. Project is located on downstream on the bridge over the South Fork Palouse River. Parking is available along the road on the west end of the project—please be aware this is an aviation field and airplanes have the right of way. 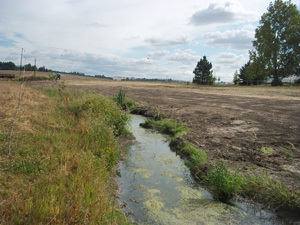 Land use activities and urbanization in the Palouse region have influenced and altered in-stream flows, channel morphology, and wildlife habitat. 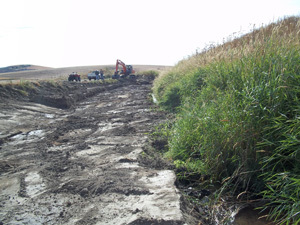 The funded riparian restoration project is Phase IV of the Palouse-Clearwater Environmental Institute’s (PCEI) effort to decrease nonpoint source pollution, improve public safety, and restore riparian and floodplain areas along the South Fork Palouse River (SFPR).Restoration activities have been completed on private property along 1,500 linear feet of the SFPR, in the middle SFPR Watershed. This project will augment IDEQ 319 FYO3 Nonpoint Source Management grant (Phase I), IDEQ 319 FYO4 Nonpoint Source Management grant (Phase II), and IDEQ 319 FYO5 Nonpoint Source Management grant (Phase III). Continuation of this work is vitally important if we are to adopt a watershed approach to managing Idaho’s streams. 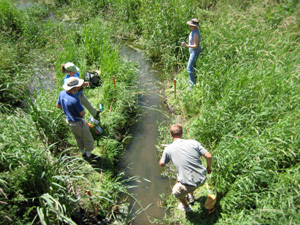 The following Best Management Practices and non-point source reduction techniques were employed: 1) reconnecting the stream with the floodplain, 2) re-sloping and stabilizing of eroding stream banks, and 3) planting of native shrubs and trees to create a variable width riparian buffer. 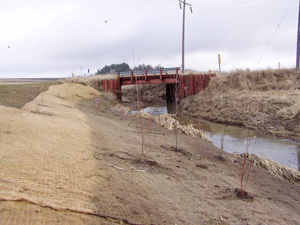 Prior to restoration activities the stream was dredged and straightened and a dike was constructed on the south stream bank to keep flood waters from flooding the adjacent property. Pre-Monitoring (July 2008): AmeriCorps members and PCEI staff monitor the site prior to the first phase of excavation activities. Monitoring includes evaluating flow, water quality and canopy cover. 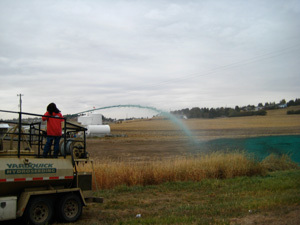 Aqua Lawn and Yard Quick Hydro-seeding (October 2009): Local hydro-seeding company at work on the project site. 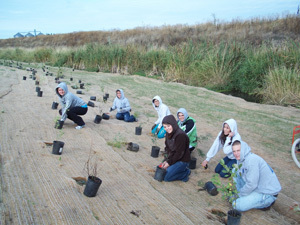 PCEI restoration projects have ecological and economic value. We hire local contractors to help us complete our restoration tasks. Kobe on the Green (October 2009): Hydro-seeding is a technique employed by PCEI following excavation activities. 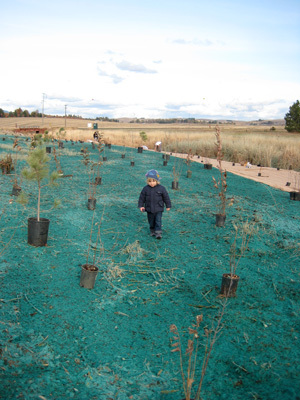 The hydro-seed mix is a combination of native grasses and wood fiber mulch. Kobe Brown enjoys a stroll through the project site. Planting Event (October 2009): Volunteers and PCEI AmeriCorps members plant native trees and shrubs throughout the project. The native plants used on site are from the PCEI Learning Nursery where we grow locally sourced plants for our restoration projects. 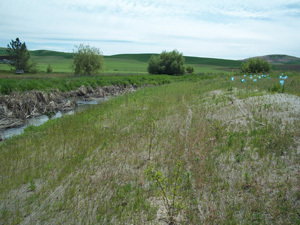 Grass Establishment (June 2010): Stream bank following high flows of winter 2009-10. Grasses are growing in nicely. PCEI crews will be watering plants and weeding the site throughout the hot months of summer. High Flows of Winter Leave Their Mark (February 2010): Erosion control fabric protect the banks during the high flows of winter. You can see how high the river came during winter 2009-10 9dark line). AmeriCorps Members Celebrate (February 2010): After numerous attempts to secure tarps around the erosion control fabric, PCEI AmeriCorps members take some time to CELEBRATE their jobs and their service! Excavation Is Tricky Business (August 2010): Darrell Paul Excavation is responsible for the beautifully carved stream banks. Phase 2 of the project took place during the late summer of 2010 on the south side of the project. We re-sloped 1,500 linear feet of stream bank. Excavation took two weeks and 88 dump truck loads! Excavation Complete (October 2010): Hydro-seeding underway on the south side of the project site. Excavated stream banks have been re-sloped. 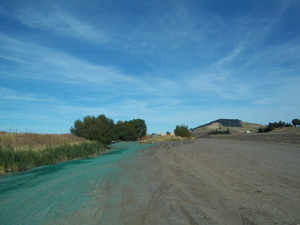 Following hydro-seeding activities the banks will be stabilized and planted. the new riparian area will buffer the river from agricultural activities taking place adjacent to the project. Floodplain Connectivity (August 2010): During 2010 the south side of the project site was excavated to reconnect the floodplain and stream channel. 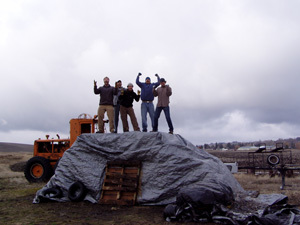 Hauling Fabric Rolls (October 2010): University of Idaho fraternities help haul roll afer roll of heavy erosion control fabric to the far end of the project site. Local University of Idaho volunteers contribute hundreds of service hours each year. Without their help our work would not be possible. 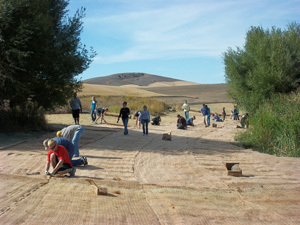 Erosion Control Party (September 2010): Volunteers from Washington State University install erosion control fabric on freshly excavated stream banks. 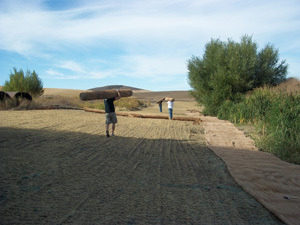 Erosion control fabric is made of biodegradable coconut fabric. 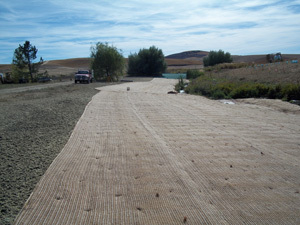 Erosion Control Fabric Super Highway (October 2010): Thousands of feet of erosion control fabric were installed to stabilize the banks. They are now ready for planting. 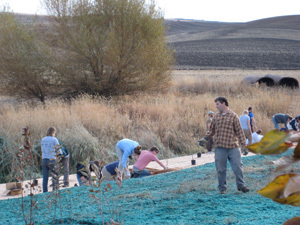 University of Idaho Soils Lab Students (October 2010): Students help us install hundreds of plants on the project site. To date 1,500 plants have been planted to help stabilize the stream bank. Planting In the Cold (October 2010): Volunteers brave the wind and rain to help plant trees and shrubs on our project site. 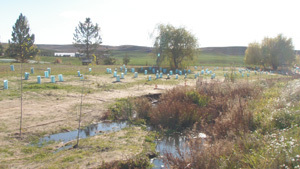 Overview of Restoration Project (October 2010): Site photo following Phase 1 (2009) and Phase 2 (2010) restoration activities. The re-sloping of the stream banks and floodplain will help reduce erosion. the native grasses, once established, will help compete with nonnative weeds and the shrubs and trees will provide cover to the creek helping to decrease stream temperatures while providing improved wildlife habitat. 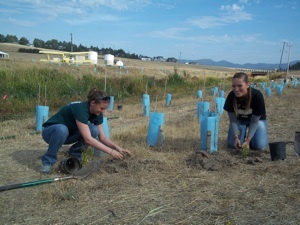 Washington State University Environmental Labs (September 2011): Students from neighboring Washington State University spend the week planting thousands of wetland plugs. Prepping For Final Seeding (September 2011): Environmental lab students from Washington State University spend the week weeding and raking prepping the site for the final hydro-seeding. Installation of the temporary irrigation system will also help reduce the weeds on site and increase germination success of the native grasses. 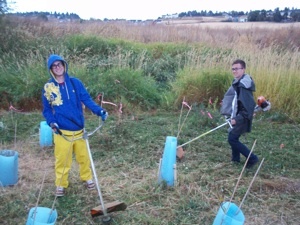 WEEDS WEEDS WEEDS (September 2011): Volunteers help control weeds on site. Blue tubes are used to help protect plants from these weeding activities.